Castleford Tigers have suffered two more injury blows with news that forwards Mike McMeeken and Mitch Clark are set to be out of action for up to two months. The club has issued an injury update detailing how many players are currently out of action and when they are due to return. 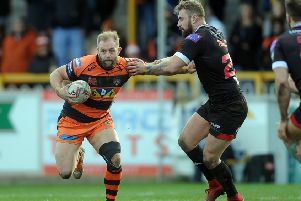 Clark has been ruled out for eight to 10 weeks with a knee ligament problem sustained in last Thursday’s victory over Hull FC at the KCOM Stadium. He has been joined on the sidelines by England international McMeeken, who missed the match at Hull following a concussion in the opening round win over Catalans Dragons, but will now be further sidelined after sustaining a hamstring injury in training. Tigers head physio Matty Crowther told castlefordtigers.com: “Mike has unfortunately suffered a hamstring tear during his return to play protocols in training. He’s likely to be out for six to eight weeks. On the other players who missed the Hull match, Crowther explained: “Oliver Holmes and Will Maher are coming back from shoulder injuries and are progressing really well. Will should be back in action during early to mid-March and Oliver the start of April. “Luke Gale’s operation was really successful. We’re still looking long-term of course but we’re not putting a timeframe on it. “Jamie Ellis has had surgery on a microfracture in his knee. On a positive note, it looks a bit better than first expected, but he’s still going to be out for around four months. There was some good news for the Tigers with Crowther saying that forward Matt Cook could be back to face London Broncos in Castleford’s next game on Saturday week. Tigers director of rugby Jon Wells said: “These are obviously significant injuries to key members of our squad – who are already well under way with their rehab and looking to be back fit and healthy in due course.